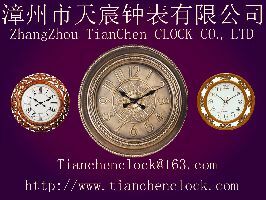 Established in 2008, TIANCHEN CLOCK CO., LTD is professional wall clock manufacturer and trading company, we specialized in wall clock, quartz clock, gift clock, iron clock, MDF wooden clock, ROHS clock, antique clock,cartoon wall clock and movement etc. Our company always working hard on management models of researching、development, production. We also have high efficiency working team、powerful design team, which laid a solid foundation for our enterprise and enjoy a good reputation at home and abroad markets such as Asia, European countries, USA, South and North America, etc. We can also design products according to the requests of customers (the sample or pattern which provided by customer can be specially developed). In sprite of “honesty,innovation, win-win” and management ideas of“Quality is the brand”, we warmly welcome to your cooperation in the near future!